I have a card to share with you today. This is my first shabby card. O:-) I made it for Robyn's Fetish Challenge #111 - Add some lace. We have fabulous sponsor for this challenge - A Day For Daisies with a great prize: $12 gift card for one lucky winner. Сьогодні хочу поділитися з вами своєю першою шебі листівкою. Якось завжди я боялася цього стилю й оминала його, але нове завдання на Robyn's Fetish - Add some lace (додай мереживо) та його спонсор A Day For Daisies (нагородою у завданні є ваучер на $12), котра має просто красивезні штампи в своєму магазині, надихнули мене на створення ось такої листівки. For my card I picked PEACOCK MAGIC image. Incredibly inspiring image!! I coloured it with Prismacolor pencils. Paper is from C'est la vie set from Melissa Frances. Lace - French General Borders Lace form EK Success. Dies I used: Nestabilities STANDARD CIRCLE LARGE Spellbinders, Nellie Snellen DOT CIRCLE Multi Frame, Memory Box ELEGANT SCROLLWORK, Memory Box FANCY BLOSSOMS, Memory Box TENDER LEAVES. Я не дуже люблю фей, але ця - PEACOCK MAGIC - мене зачарувала. Надзвичайно подобається мені це зображення, її повітряність, легкість... Сподіваюся, що мені вдалося передати те, як я бачу цю фею, на листівці. 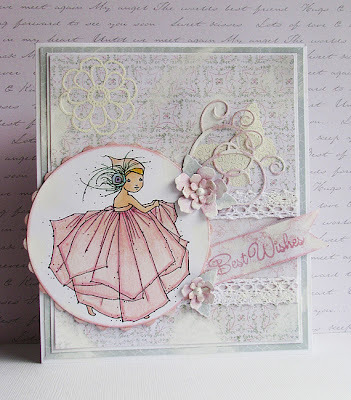 Beautiful card with a stunning image and gorgeous details, I just adore the soft colours! Thanks for taking inspiration from our ice cream colours challenge over at Allsorts this week and good luck! So soft and pretty! 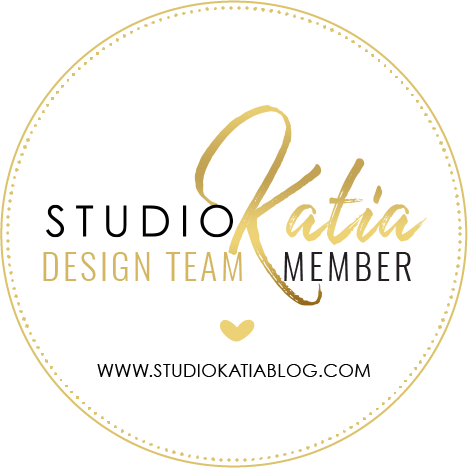 I love the image you used. 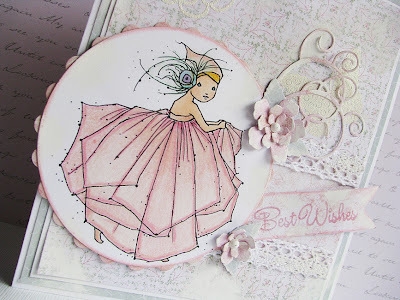 Gorgeous card, I absolutely adore your paper. And the choice of "pastel" colours are just stunning.